A JOLLY HAPPY SOUL New Horizons snapped this picture of 2014 MU69 (nicknamed Ultima Thule) from a distance of about 28,000 kilometers, about half an hour before the spacecraft's closest approach to the space rock. Clearer pictures should arrive in the next few days. "Think of New Horizons as a time machine ... that has brought us back to the very beginning of solar system history, to a place where we can observe the most primordial building blocks of the planets," said Jeff Moore of NASA's Ames Research Center in Moffett Field, Calif., who leads New Horizons' geology team. "It's gratifying to see these perfectly formed contact binaries in their native habitat. Our ideas of how these things form seem to be somewhat vindicated by these observations." 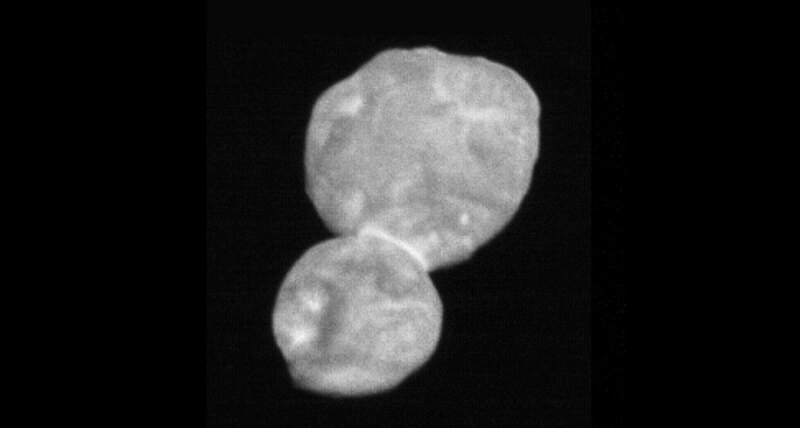 The view from about 28,000 kilometers away shows that MU69 is about 33 kilometers long and has two spherical lobes, one about three times the size of the other. The spheres are connected by a narrow "neck" that appears brighter than much of the rest of the surface. That could be explained by small grains of surface material rolling downhill to settle in the neck, because small grains tend to reflect more light than large ones, said New Horizons deputy project scientist Cathy Olkin of the Southwest Research Institute. Even the brightest areas reflected only about 13 percent of the sunlight that hit them, though. The darkest reflected just 6 percent, about the same brightness as potting soil. Measurements also show that MU69 rotates once every 15 hours, give or take one hour. That's a Goldilocks rotation speed, Olkin said. If it spun too fast, MU69 would break apart; too slow would be hard to explain for such a small body. Fifteen hours is just right. The lobes' spherical shape is best explained by collections of small rocks glomming together to form larger rocks, Moore said. The collisions between the rocks happened at extremely slow speeds, so the rocks accreted rather than breaking each other apart. The final collision was between the two spheres, which the team dubbed "Ultima" (the bigger one) and "Thule" (the smaller one). That collision probably happened at no more than a few kilometers per hour, "the speed at which you might park your car in a parking space," Moore said. "If you had a collision with another car at those speeds, you may not even bother to fill out the insurance forms." New Horizons also picked up MU69's reddish color. The science team thinks the rusty hue comes from radiation altering exotic ice, frozen material like methane or nitrogen rather than water, although they don't know exactly what that ice is made of yet. The spacecraft is still sending data back to Earth, and will continue transmitting details of the flyby for the next 18 months. Even as the New Horizons team members shared the first pictures from the spacecraft's flyby, data was arriving that will reveal details of MU69's surface composition.